Profile：Leaning Chinese .This section providing a wide range of reading materials (including extensive reading, bilingual news, etc) for Chinese learners. The learners can get news happened in China timely. Director Zhang Yimou said 3-D movies cannot take the place of 2-D movies for logistical and cultural reasons. 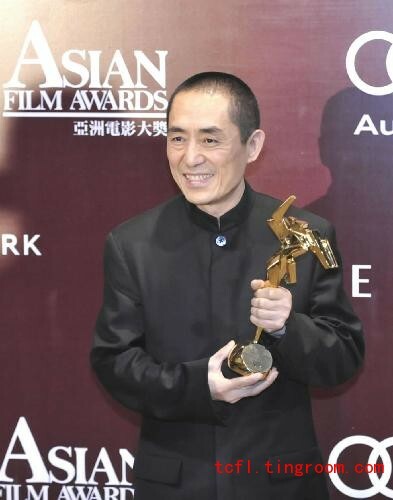 "Undoubtedly, Avatar has considerably boosted the development of 3-D movies," Zhang said after receiving the outstanding contribution award at the 4th Asian Film Awards in Hong Kong last Monday. "But I think James Cameron is too optimistic about the future of 3-D movies. It is impossible that all the world's movie theaters can be transformed to 3-D theaters in three to five years." Cameron, who directed Avatar, had predicted that 3-D movies will replace 2-D movies in three to five years. Zhang said 3-D movies will become a very popular cinematic format but no matter how much they evolved, they will not take the place of regular 2-D movies because cinema should be diverse. Zhang is currently working on two projects, neither of which will be in 3-D: The Love of the Hawthorn Tree (Shan zha shu zhi lian), adapted from Ai Mi's novel of the same name, a love story set during the Cultural Revolution, and The 13 Women of Nanjing (Jin ling shi san chai), another period piece set during the 1937 Nanjing Massacre. He said that he does not think it is the right time for him to make 3-D movies now, but he will try to make one when it is.